We trialed several different Help Desk / Ticketing solutions from various vendors and in different price ranges (including free). We ended up falling in love with Jitbit thanks to its quickness to run, ease to install, backup, migrate, and update and fantastic support staff. I think that my favorite thing may have to be how responsive the vendor support is; we've had several suggestions become actual features over the years. I don't love the roles system. There are "technicians", "administrators", and "users". The technicians can be per-category, but then they are still seemingly more than just users on the categories for which they are not technicians. In addition, there doesn't seem to be a good way to allow a user to have full read access to all tickets in a category or section without giving them technician access as well. Go for it! I think it's definitely worth it to do the free trial. As a whole, we typically stay away from cloud products and prefer to go with on premises solutions, so that's what we've done with Jitbit as well. Initially, we were only looking for a ticketing system for our internal technology help desk. We ended up quickly adding our Facilities team and later our public services team for external patrons to receive help and set up special collections and recommendations. We trialed a few diverse Help Desk/Ticketing arrangements from different sellers and in various value ranges (counting free). We wound up experiencing passionate feelings for Jitbit because of its speed to run, straightforwardness to introduce, reinforcement, relocate, and refresh and awesome care staff. I believe that my most loved thing may must be the way responsive the merchant support is; we've had a few recommendations turned out to be real highlights throughout the years. I don't love the jobs framework. There are "experts", "directors", and "clients". The specialists can be per-classification, however then they are still apparently something other than clients on the classes for which they are not experts. Likewise, there doesn't appear to be a decent method to enable a client to have full perused access to all tickets in a classification or area without giving them specialist access too. The Jitbit helpdesk arrangement is an extraordinary arrangement whether you have 1 or numerous specialists dealing with various classifications of issues. Too we have executed extra depts. to use the framework as the ticketing and the email warnings are incredible resources for this instrument. At first, we were searching for a ticketing framework for our interior innovation help work area. We wound up rapidly including our Facilities group and later our open administrations group for outer supporters to get help and set up uncommon accumulations and suggestions. We trialed a few distinctive Help Desk/Ticketing arrangements from different sellers and in various value ranges (counting free). We wound up beginning to look all starry eyed at Jitbit because of its briskness to run, straightforwardness to introduce, reinforcement, relocate, and refresh and awesome care staff. I feel that my most loved thing may must be the manner by which responsive the seller support is; we've had a few recommendations turned out to be real highlights throughout the years. I don't love the jobs framework. There are "experts", "heads", and "clients". The specialists can be per-class, however then they are still apparently something beyond clients on the classifications for which they are not professionals. Likewise, there doesn't appear to be a decent method to enable a client to have full perused access to all tickets in a classification or segment without giving them professional access too. Pull out all the stops! I believe it's very justified, despite all the trouble to do the free preliminary. In general, we regularly avoid cloud items and like to run with on premises arrangements, so's what we've finished with Jitbit also. At first, we were searching for a ticketing framework for our inside innovation help work area. We wound up rapidly including our Facilities group and later our open administrations group for outer benefactors to get help and set up unique accumulations and suggestions. I like that the system is able to be used both on mobile platforms and on desktop platforms universally. It makes it easy for a technician who is always on the go to be able to access it any way shape or form. The app they developed is really under developed. Functionality wise, the desktop version allows for more use then the mobile. The mobile is clunky and unable to do critical functions that a tech on the go would want. Luckily chrome allows desktop mode, but its still difficult to utilize. We utilize this in the school district to track tickets on all fronts. Be it Field techs, Network Techs, Testing Database Engineers, Information software, or down to the simplest of forms, phones. This really helps us keep track of time frames on answers, allows for more flow, and comprehensive communication between all departments without losing track of where someone else has gone and what else has been done. The benefits of adding assets as well is great, I do wish we could import a full spreadsheet with columns filled out to make life easier rather then adding assets through their means but I understand that its a difficult to form a solution for every situation. "Great for smaller to mid-size IT operation"
The reporting tool is great, you can drill down to your ticketing system by date, assigned agent, ticket status and more. You can also analyze how your support guys/gals are performing from several metrics available within the reports. The product is highly customizable which is great but it can also be a bit bland on the UI/UX side. Definitely recommended. However, consider this strictly as a helpdesk tool. Jitbit doesn't have bells and whistles like its larger competition (think landesk) that allows software deployment, remote desktop etc. It serves us well in the capacity of organizing helpdesk tickets. We know we have live chat capability but we decided not to use it in our setting. We are internally using Jitbit to create and manage helpdesk tickets. Our call volume has drop significantly and implementation was a breeze. Good support, straight forward product and worth every penny. "Perfect and amazing for internal work queues"
The ability to create custom actions with JSON/Links/whatever allowed quick and dirty integration with a handful of internal projects; closing off of tickets in JIRA, kicking off builds in Buildmaster, and generally any API action you want is within reach. No group level permissions Pure social media integration. The software is desperately missing the ability to log out a user. As admins, we use a regular user for working with tickets and an admin user for administrative tasks. Currently, there's no way to switch between the two without deleting cookies, going Incognito, or using a different browser. Very cumbersome. If you need the software for ticket management, then this is the one. To manage our incoming customer support e-mail. Easy to use, streamlined ticket management and help desk software solution. We've realized easier and more efficient management of ticket workflows, as well as more timely resolution of tickets. "Trying JitBit a little bit"
For sure, what is the most surprising feature of this product is the opportunity to organize your work sub dividing the total amount between colleagues. This aspect was also well received by the members of my team. The work flow seems to be smoother than before, even with a reasonable adaptability period with this trial version. Actually there is no much aspect to bad charge in JitBit, but one of my less favourite is the lack of some status in managing the tickets and the font used. Of course this last one is my only opinion, fully subjective, maybe another user could find the font really nice. Our usage was not complete due to our aim to reach. So, there are some aspects that we did not try such as Chat Support or Interactive Voice Response for which we can't put any evaluation. When other companies will try to make a test with JitBit I will advice to use it with a group of at least 5 people to better understand the usage of a multi user kind of work. The division of the work is of course a benefit for a company. My company had a positive feed-back in terms of quicking the speed of working each tickets or item received by setting in parallel the management of each one between my team members. Also the reporting part, which is my main task, was easy to use and to interact in terms of customizing the report table and format. JitBit is easy to configure, UI is clean and user-friendly. The ticket system is one of the best features of JitBit. The created tickets can be viewed in the main panel of the software, the fields are shown as date, agent in charge, priority and status. The best thing is that we can categorize the tickets using the automation rules and can customize the fields. It also provides the ability to integrate with multiple applications to improve its performance. It is a simple technological product that provides great results. I have no negative comments to add. It works seamlessly. I recommend it because it adapts to the needs of any company, it gives good value for money and increases the efficiency of customer service team. Improves customer interaction and gives us a solution to solve user's problems quickly. "It's a great helpdesk solution"
Jitbit has the feature we need: an organized and effective ticket system. The mobile application is fantastic, with a responsive and simple design, it allows me to keep up with the updates of the other team members. I can also answer tickets from anywhere. On the other hand, it integrates quite well with Slack, which enables us to communications and the resolution of cases that require specialized technicians. If I compare it with alternatives like Freshdesk, Jitbit needs more advanced features. It is the perfect solution for businesses that need a helpdesk with basic functionality. I am satisfied with the Jitbit performance . It's very efficient software to manage customer support. It provides the tools to provide the fastest and most effective attention to our clients. This tool continues to evolve as a very powerful helpdesk solution for multiple techs. We are happy with the solution as they continue to come out with updates adding to the existing features we really like with the tool. The Jitbit helpdesk solution is a great solution whether you have 1 or many techs taking care of multiple categories of problems. As well we have implemented additional depts. to utilize the system as the ticketing and the e-mail notifications are great assets for this tool. We are able to have a highlevel overview of all our support tickets and they are all broken down in reports where we can drill into a particular category and then into a particular day, month, year or even a Technician. I like the simple Jitbit interface, it's intuitive. In addition, it reduces the attention of repetitive tasks and allows us to focus on priority tasks such as solving tickets with a high level of urgency. It is agile software, ticket management is simple. It is really efficient since it increases the productivity of the support team. I think it lacks some advanced customization features. Jitbit is compact and with basic functions to improve customer service. The price is affordable for small and medium companies that want to grow. For our organization, customer service is better thanks to the ticket system and the automation of repetitive tasks. The metrics that give us the periodic reports are essential to measure performance support team. "Perfect for internal work queues"
The ability to purchase the source code is fantastic, but even without this ability the customization of the product is great. The ability to create custom actions with JSON/Links/whatever allowed quick and dirty integration with a handful of internal projects; closing off of tickets in JIRA, kicking off builds in Buildmaster, and generally any API action you want is within reach. Above all the ticket ownership/searching is very confusing when using it to find linked/related tickets. It is often that a ticket will not show up based on the roles/ownership and the order it pulled in, even though it is clearly something that should be selected - this is easy to fix with the source code. It is apparent mostly when used within the context of having segregated work queues with agents not sharing most queues. Another catching point is the way emails are handled; customers tend to use them as conversation chains and it gets very confusing determining the response path when multiple users start to reply to the ticket and outside of it. I think this is a problem in many systems, but it received a lot of negative feedback. Shell out the additional cash for the Source Code; you may never need it but it is super cheap and could be handy in the long run. In a previous company that had an inability to finish projects there was a requirements to build a more agile workflow. A key effort in this was determining the constraints and elevating them. With larger companies this can be troublesome, but it can be easily done in groups with Kanban boards and the like - but this also requires some effort and support by management. In our situation, there was not enough time, not even for DIrector level positions and Jitbit plugged nicely into the system and was adapted to by the entire Dev team, DB team, and later the Security teams. It allowed an operational oversight into all work that was occurring and thus allowed us to identify constraints and correct. "Not bad, makes managing customer support easy"
ery powerfull the automatism tool, you can create a rule for everything (mail warning, automatic assignment, tagging, You can reply from your e-mail or from the website portal, whichever is easiest at the time. Each incoming e-mail creates a ticket that date/time stamp tracks all responses, so you can see a clear history. Excellent customer support for advice, set up and ongoing support. Very fast response time. Gives you what you expect but with an extra quality in the product. My department try to use Jitbit to manage our incoming customer support e-mail. We've been using this for 2 months. We trialed a few diverse Help Desk/Ticketing arrangements from different sellers and in various value ranges (counting free). We wound up beginning to look all starry eyed at Jitbit because of its briskness to run, simplicity to introduce, reinforcement, relocate, and refresh and awesome care staff. I imagine that my most loved thing may must be the manner by which responsive the seller bolster is; we've had a few proposals wind up genuine highlights throughout the years. I don't love the parts framework. There are "professionals", "overseers", and "clients". The specialists can be per-class, however then they are still apparently something beyond clients on the classifications for which they are not professionals. Moreover, there doesn't appear to be a decent method to enable a client to have full perused access to all tickets in a classification or area without giving them expert access also. Let it all out! I believe it's very justified, despite all the trouble to do the free preliminary. All in all, we ordinarily avoid cloud items and want to run with on premises arrangements, so's what we've finished with Jitbit too. At first, we were searching for a ticketing framework for our inside innovation encourage work area. We wound up rapidly including our Facilities group and later our open administrations group for outside benefactors to get help and set up uncommon accumulations and proposals. "Long time user and admin of service desks"
A few years ago I came across a hosted help desk software online that seemed to have the right mix of features for an affordable price. I chose to use JitBit for a project that ended up being very successful in part thanks to this software for tracking and responding to customer requests. Each month/quarter/year, JitBit adds features that make sense and are more and more comparable to the big names I used to see on Gartner reports. I used to sell software that cost several times as much and was hardly as easy to admin! For a company getting started with tracking requests, this is a software company to seriously take a look at for your project's needs. Thank you JitBit team! Although they are extremely responsive to email, I miss phone support. It'd be nice to speak with the team directly even though I don't need to. Tracking and responding to customer requests in a timely manner. Accountability is clear and follow up is make easier. "Great and easy to use ticketing system"
The web interface and email integration (the ability to create/reply to tickets via email) are my favorite features. "Great solution fo ticket handling." It is easy to handle and integrate. There isn’t a learning curve when it comes to start using it with the customer service personal. Nothing to dislike so far. They are quick to fix and repond when opening a support ticket. We are solving customer service and support. Every time a customer sends us an email using the contact form or replying to an order email it opens a ticket and we can easily manage each step and see who said what in case the customer calls. "JitBit is the next big thing!" Jitbit Helpdesk is a great helpdesk app with clean UI and simple set up process. But all the features are there: automation engine, file-attachments, integrations (JIRA, Slack, Dropbox, Github etc), email-integration, Knowledge-base module etc. etc. Jitbit Helpdesk is offered both as a SaaS version and an on-premise tool installed locally on a server. "Jitbit has been a useful introductory ticketing system." User interface is intuitive and easy to navigate. Difficult to avoid email loops caused by automatic responses. We use Jitbit to centralize communications of issues for several functional areas. We have seen benefit in being able to track issues more efficiently. We also have derived benefit from the low cost of the solution. "Effective but clunky and uninituitive "
"Very easy to use, awesome to create tickets"
very ease to use, also great software to support your client. How the software divide the function, sometime this can cause some problems, because the clients dont know how to use very well. If do you need any software to have chat and comunicate with your clients use it! Is very easy. The ticket assigning system is something anyone can look up to. For me it's the best so far. The mobile application of the Jitbit helpdesk need a lot of polishing in terms of service & responsiveness. I am using this for Incident Management and Ticket Management. It provides a simple, user friendly interface to helpdesk users. Administrator also has all the options to manage the system. Not much to mention i found it very professional. We have been using it to resolve customer requests. To manage approvals for various categories. 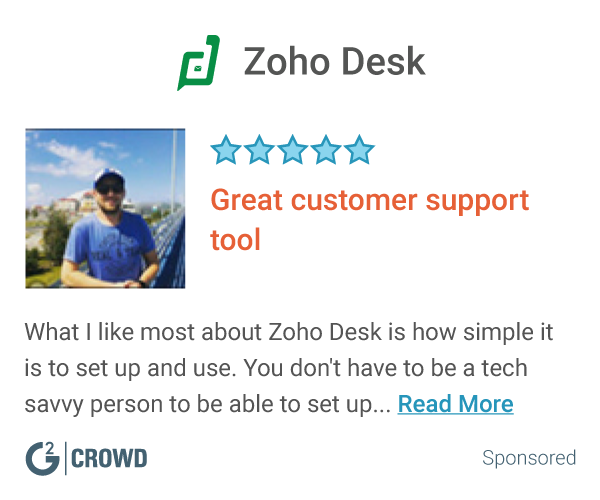 "Great help desk software for small to midsize businesses"
I was using this software at one of my previous jobs and was very pleased with the quality and features of this product. Not only you can reply to your tickets via email (all help desks do!) but also close, assign and so much more. It's strongest part is the concept of remote management - via app or email, anywhere you are. Another good thing - canned responses and solutions that can be shared across your team - true time saver. I didn't find anything bad at all which is unusual for me. Write list of tasks your help desks software has to serve then start evaluation trial using cloud version. "Everything is great with Jitbit Helpdesk!" The automation tool is powerful.You can respond directly from your e-mail/site portal. Every incoming e-mail fosters the creation of a ticket. The date/time stamp is capable of tracking responses.! It needs to have some sort of integration with social media.! My department is making use of Jitbit. It does its job well in the managemetn of incoming customer support via e-mail.! "I greatly enjoy the most advanced technical platform - MS SQL Server and ASP.NET." It assign agents to different areas. Control tickets visibility, tracksyour assets and assign them to users. You can attach documents, screenshots and PDFs to your tickets. Maintain a knowledge-base. Tag and categorize your tickets. And enjoy the most advanced technical platform - MS SQL Server and ASP.NET. There is nothing about this that I do not like. I highly reccomend this software for ease of use and organizational skills. We are now maintaining a knowledge-base, we can tag and categorize tickets. And enjoy the most advanced technical platform - MS SQL Server and ASP.NET. The best feature is for users to manage requests from multiple sources by assigning them customized tags and categories. Different visualizations are available for dashboards and reporting purpose. Improvement in the mobile app much needed. Mostly Ticket and Incident Management. The best thing about Jitbit is the ticket allocation system is something that anyone can admire, for me it is one of the best things from afar. The mobile application has much to improve, you have to polish the application in response and help topic. I use it to manage tickets and incidents. After trying numerous different Ticketing and Help Desk products we settled with Jitbit. It was so easy to install and run. It is also easy to get in touch with the vendor with any questions/concerns. The roles seem pre-determined and we haven't figured out a way to change them. Also no group level permissions. Very good quality product. I would recommend this product for anyone with a lacking of help desk software. Managing customer inquiries as we need a better workflow that is more agile and open. Now we can track customer inquiries with so much ease. "Not as helpful as it should be"
El sistema de asignación de ticket es una cosa que cualquiera puede admirar, para mi es una de las mejores cosas desde lejos. "Nice and clean UI, users love it"
Not bloated with a zillion features, like some other "everything for everyone" systems, but still a powerful helpdesk. A self-hosted version is a nice addition. We actually chose this product for the self-hosted option, but the company has convinced us to go for the HOSTED one, and we're more than happy we listened to them. Also, loved the "automation" engine ("if this - do that"), the mobile apps and JIRA integration ( we list our internal scripts bugs there and do the change management ). Overall - a very nice and moderately priced app. The asset-management module is pretty basic, although it does the job. Also, no Twitter integration (even though they do offer a workaround for this). No user forums, but the Knowledge-base module does the job. Oh, and their search engine sometimes glitches, especially when you search for weird abbreviations and other "non-existing" words. They claim to fix this in the next release. The iOS app push notifications feature also breaks form time to time, also claim to fix this in the nearest future. Make sure you try the hosted trial version, not just the downloadable trial version! The "downloadable" trial has no time limits but has a couple of minor features disabled, so you should test the hosted one to get the whole idea. We're a healthcare org's IT department that deal with the employees problems. Also, my team uses the software through smartphones a lot. "JitBit - Perfect for a Helpdesk solution"
Jitbit provides the ability to create multiple technicians with one license. Also, the integration with active directory and Google apps makes user management a lot easier. When using active directory there is no log out button. A Web based help desk solution for a 150 + users. Submitting tickets via email is also great! "As a Quality Systems Manager, I relied on Jitbit Help Desk to keep customers happy!" How quick it was to set up and the mobile app which helps me stay connected and updated. Had some compatibility issues with Chrome initially that I had to take care of. We used a proprietary quality management software system to track customer and supplier issues. Although the software is great, as the architect and administrator I needed a system for helping my internal customers submit and track issues they were having. "Quick and dirty ticketing system"
Mobile app is problematic and it is difficult to get support to respond. Provides a ticketing system for other service departments in the company that is easy to use and easy to learn. "Used it for a IT support end user position"
The simplicity of JitBit made everything so much easier. It was plain and simple so you were able to navigate easily. Sometimes it will automatically log you out. Used it for tickets and solving tickets. It showed your stats at the end of how many tickets you have handled and how many your team members have handled. Ease of setup, ease of use. We needed a better ticket solution for our Library and this worked perfectly. cloud hosted. I would prefer a solution that we can use on premises. Quick and easy to setup if you want to try it out. We found this to be a great product. Love that it is easy to use . This is helping with saving time. Automate and boom. Simple - easy to implement and can be implemented within small organizations or large scale operations. Not as many features as it’s competitors. Organization of tasks and tickets. Nothing by the moment. I will tell you. Very user friendly. No downtime or lagging. Inability to easily filter without specific keywords set up by admins. * We monitor all Jitbit Helpdesk reviews to prevent fraudulent reviews and keep review quality high. We do not post reviews by company employees or direct competitors. Validated reviews require the user to submit a screenshot of the product containing their user ID, in order to verify a user is an actual user of the product. Hi there! Are you looking to implement a solution like Jitbit Helpdesk?